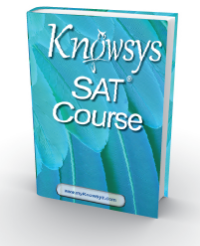 Knowsys has completed the full update to our PSAT and SAT workbooks. Those of you wanting preparation materials for your Juniors taking the PSAT in October may begin ordering now. Soon Knowsys will post our analysis of the New PSAT and SAT. There are major changes. Suffice it to say that the New SAT is basically the ACT plus; in the past, the ACT was the SAT plus. Please contact us at info@ktprep.com or call 512-961-8522 to get pricing information on the new materials. By the end of July Knowsys will have an updated SAT Vocabulary word list as well as the SAT Vocabulary Builder Activities. Knowsys will also have some new exam prep products available at the end of July!